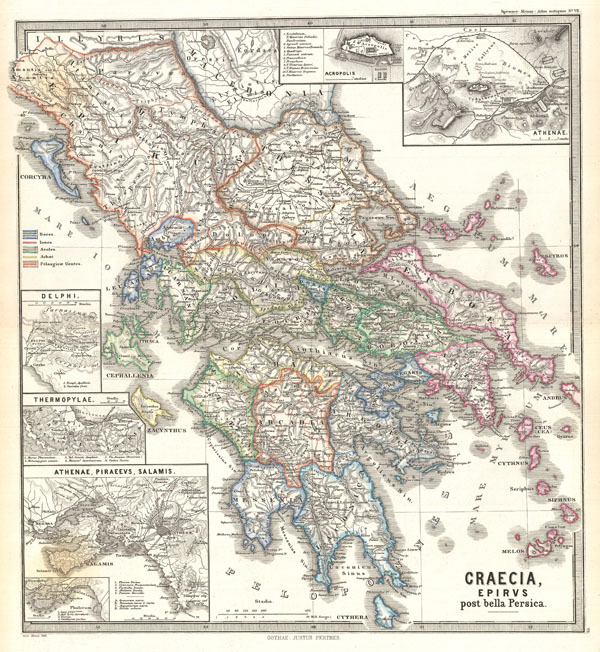 This Karl von Spruner's 1865 map of Graecia, Epirus post Bella Persica, or Greece, Epirus after the Persian War. This beautiful map is outlined in color and covers the entire area of modern day Greece. The map also features 6 inserts, showing Acropolis, Athens, Delphi, Thermopylae, Piraeus, Salamis, and a close-up depiction of the island of Piraeus. Each inset includes a scale and map key or legend, including a key to the territories of ancient Greek gods. Important cities, rivers and mountains are labeled. Countries and territories are designated with colored borders. The whole is rendered in finely engraved detail exhibiting throughout the fine craftsmanship of the Perthes firm. Rumsey 1626.007. Phillips (atlases) 3288. Espenhorst, J., Petermann's Planet, p. 397-404. Espenhorst, J., Andree, Stieler, Meyer & Co., p. 148.